A skilled and keen climber throughout his teenage years, at the age of just nineteen, Red Széll learned that he was going blind. His harnesses seemed to be packed away forever but after twenty years he began climbing again which led him to tackle the treacherous Orcadian sea stack The Old Man of Hoy. This inspiring extract shows Red’s long-standing love of climbing and details how the devastating diagnosis of Retinitis Pigmentosa led him to dangerous ‘night climbing’. According to my mother I began climbing to escape boredom and inertia at an early age, learning to scale the sides of my cot and mastering the downward traverse to my toy-box before I was a year old. As I grew up I emulated Spiderman’s vertical ascents on every available play-frame, tree or building and watched John Noakes’ exploits with a mixture of awe and envy. Blue Peter also introduced me to the great mountaineering feats of the 1970’s and 80’s and I followed the expeditions goggle-eyed on the BBC. The death of Nick Estcourt on K2 had a greater impact on me than that of Elvis a few months earlier. Chris Bonington had become a familiar figure from all his media work, but it was the simultaneous appearance of Joe Brown and The Old Man of Hoy on my TV screen in about 1984 that convinced me I could take my love of climbing to another level. Bonington was a larger-than-life gentleman-adventurer type but Brown came across as an ordinary bloke, a Manchester plumber. And The Old Man was a rock cathedral summoning the faithful that, in comparison to the mountaineering meccas of Anapurna and Everest, lay on my doorstep. This form of climbing looked extremely accessible. Rural Sussex is not renowned for its crags and peaks but the school’s Cadet Force promised a summer camp in The Brecons that included a couple of days rock climbing training with The Army; so I signed up and suffered a year’s square-bashing as my fee. The course was so good that I stayed in the Cadets for another two years by the end of which both my climbing and marching were pretty sound, before escaping to the sixth form rock club with its twice-termly trips to Harrison’s Rocks in Kent. I was hooked. At university I bypassed the Mountaineering Club, my recollection is that they were too Alpine for my taste and pocket, preferring the buttresses, slates and parapets of Cambridge’s roofline instead. The company was good, the protection minimal if there at all. Perhaps it is as well that access to the window ledge necessary to complete The Senate House Leap (The K2 of Cambridge Night-Climbing, requiring the traverse of an 8ft wide void 70ft above the cobbles) was barred by the occupancy of a responsible adult in the room beyond. RP is a degenerative eye condition that affects the photoreceptors at the back of the eye. First the rods, responsible in the main for night and peripheral vision die off, followed by the cones and their colour vision. 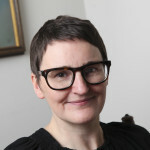 If you’re lucky the bundle of cells that form the macular and are responsible for central vision hang around for a few years but they too are on borrowed time. Back in 1989 I was still in the early stages. My field of vision had only decreased by about a quarter of the standard 95 degrees and I had yet to experience the joys of photopsia (the constant kaleidoscope of flashing lights that burst across my vision as my brain tries to fill in the gaps left by my increasingly dead retina). Climbing, however, is all about trust. If I could no longer trust my own abilities how could I expect anyone else to want to climb with me? At the same time though, more than ever, I needed the release; I needed to feel in balance with myself. I began to push my luck. Night-climbing in states of Dutch courage that make me cringe for my safety now (bear in mind it was a lack of night-vision that had got me referred to the consultant in the first place) to prove to myself that I could beat the condition. My favourite ascent, that of the North East face of The Fitzwilliam Museum, topped out at a glorious glass cupola where I could enjoy a spliff before my descent. Maybe this is why I can remember so little of the English Literature I was meant to be reading at the time. Certainly being too wasted to be scared stiff saved me from serious injury on the couple of occasions I took nasty, unprotected, falls. Red Széll will be presenting RNIB Radio’s ‘Read on’ programme from the 13th of January. With 154,000 listeners per week ‘Read On’ is broadcast on Fridays at 1pm and repeated on Sundays at 2pm and Mondays at 6pm on Freeview Channel 730, on-line and the programme is available as a podcast on iTunes. 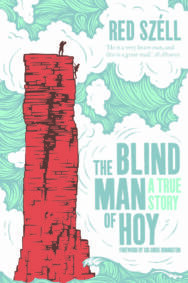 The Blind Man Of Hoy by Red Széll is out now published by Sandstone Press priced £8.99.